We’ll give you text you can be proud to publish. 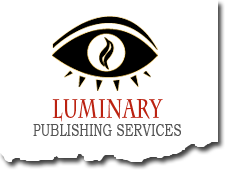 Luminary Publishing Services provides a full range of editorial services on a freelance basis. You can engage us for copyediting and proofreading, or substantial developmental editing. The types of material we edit include trade books, textbooks, magazine articles, marketing literature, and other corporate communications. We offer efficient turnaround, precise and thoughtful attention to detail, and, above all, clear communication that makes us easy to work with. "Becky is on the top of my list of freelance copywriters." See what else our clients have to say. We've served independent authors, small publishers with as few as three full-time staff, and publicly traded companies with tens of thousands of employees. We've edited a variety of material: books to entertain popular audiences, heavily regulated school textbooks, news and feature articles, scientific manuscripts, catalog copy for direct mail, and web site content. We take pride in understanding the unique needs of each client and every project we take on—whether it be technical precision, marketing sensibility, or preserving the author's voice. If we aren't the best available editors for your manuscript, we'll decline the work or refer you to someone who can do it better. Basic technical errors—misspellings, faulty punctuation, inconsistencies, misused words, and factual errors—can make you look like an amateur. Readers will use your writing as a quick indicator of how smart you are, and of how much you care about the quality of your work. Simple mistakes are the second fastest way to lose a reader's trust. Convoluted writing, even when it's free of technical errors, tends to confuse rather than inform the reader. An editor can strip away the tangled language and let the writer's meaning emerge. An especially sensitive editor—like those at Luminary—finds a way to preserve the writer's unique voice in the process. Clichés go "in one ear and out the other." They don't help to make your meaning memorable. A good editor will detect ineffective, unoriginal language and help you to replace it. In content editing, we'll find the passages that don't support your message and get rid of them. We'll point out gaps in your narrative and suggest ways to fill them. Luminary is home to the Writer's Database, a free web-based application for writers to keep track of manuscript submissions, magazines and other markets, and words written over time.